Ctra. Velez Malaga a Benamocarra km. 1.5, 29700 Velez Malaga, Spanien. Charm hotel surrounded by nature in Velez. 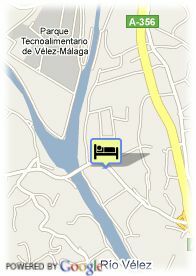 This hotel is surrounded by streams and rivers, of white-houses villages and by fantastic beaches. 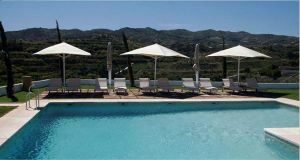 The Cortijo Bravo hotel offers originality. A careful mixture of Andalusian and British style through noble materials and refined inner design makes from this hotel a unique place. The same special design you can find in its 20 comfortable rooms, each one of individual atmosphere. Moreover, the hotel has a luxury lounge, perfect to hold any kind of events, a restaurant with traditional cuisine of Andalusia, and a magnificent outdoor pool. ältere Kinder und Erwachsene: 46.81 € pro zusätzliches Bett.